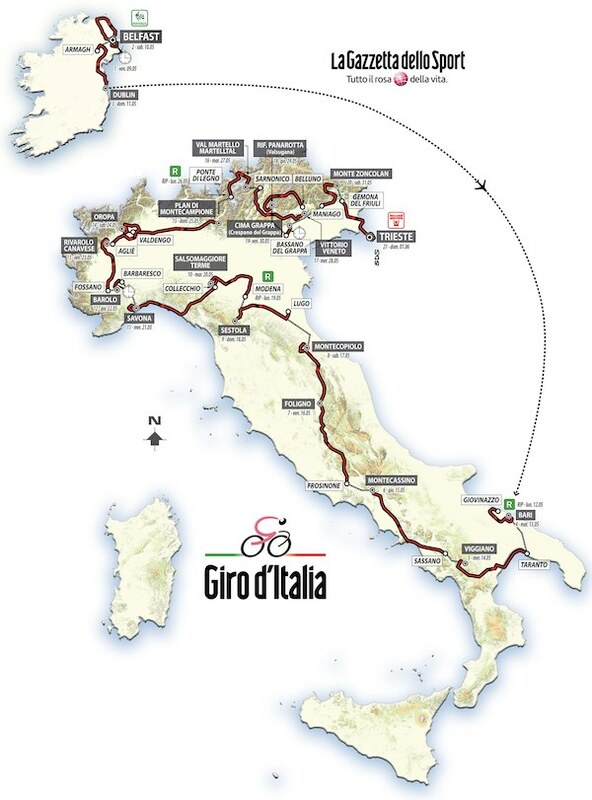 The 2014 Grand Tour season gets underway this week with the beginning of the Giro d’Italia. But things aren’t quite as the usually are – stage one takes place on a Friday (May 9) rather than the traditional Saturday beginning, and will take place in Belfast, the first time the Giro has ventured outside of continental Europe. The Irish depart demonstrates the increasing globalised character of the Giro. Where once the race was populated by Italians, recent editions have attracted riders from across the globe, so much so that 2012 saw a Canadian winner (Ryder Hesjedal), while a Colombian (Rigoberto Uran) finished second last year. This year, the top three favourites according to the bookies represent three continents: Nairo Quintana for South America, Joaquim Rodriguez for Europe, and Cadel Evans for Australia. The new, cosmopolitan Giro goes some way to explaining the decreased success home riders have enjoyed in recent editions, but, although Vincenzo Nibali’s victory last year papered over the cracks, it also seems as if Italian cycling is in decline. Whereas all eleven Giros between 1997 and 2007 were won by Italian riders, foreign riders have been victorious in half of the past six editions. 2012 was only the fourth time no Italian even managed to make the podium, and 2014 looks likely to become the fifth. It is difficult to remember an edition with such pessimistic prospects for the hosts than 2014. The nation’s hopes rest mostly on riders who aren’t as good as they used to be (Ivan Basso, Michele Scarponi, Damiano Cunego), with only a few talented rider whose careers are still on upward curves, but are yet to make a grand tour podium (Domenico Pozzovivo, Diego Ulissi). Instead the Italians will be hoping for multiple stage wins, but that will be difficult in an opening week consisting mostly of flat stages expected to end in bunch sprints, in which the likes of Elia Viviani (Cannondale) and Roberto Ferrari (Lampre-Merida) will struggle to compete with Marcel Kittel (Giant-Shimano) and Michael Matthews (Orica-GreenEdge). Neither are Ireland’s two stars Dan Martin (Garmin) and Nicholas Roche (Tinkoff-Saxo) likely to make much impact in the opening stages finishing in Dublin and Belfast, a team time trial and two flat stages. Martin’s Garmin are more geared towards climbing than time trialling these days, meaning that this year’s inaugural pink jersey will likely go to a rider for a specialist team like Omega Pharma-QuickStep or Orica-GreenEdge. With bonus points on offer, the jersey will likely change hands again in the following flat stages, which, with so many riders still in contention, will probably see lots of crashes. A few medium mountain stages will see more non-climbers slip down the overall classification, but the first real shake doesn’t occur until almost two weeks into the race, in stage twelve’s 46.4km individual time trial. With a very mountainous final week in store, this stage marks the only opportunity for specialists against the clock to put time into the climbers. The hellish finale kicks off at the penultimate weekend with a double header of mountain top finishes, first at the Oropa, then the Montecampione. The race gets even harder after the final rest day, with three more mountains tackled in both stage 16 and 18 (including the Stelvio, the highest peak in the race), before building to a crescendo with a mountain time trial and a finish on the mighty Zoncolan in stages nineteen and twenty. With the most difficult stages occurring at the back end of the race, it’s conceivable that the rider wearing the pink jersey on the Zoncolan will not be same as he who wears it in the final, processional stage into Trieste. The well-balanced, well-planned route, as well as the multinational peloton, should ensure a tightly contested and class edition of the Giro d’Italia. Live coverage of the 2014 Giro d’Italia will be shown on digital and satellite channel British Eurosport. Sky Sports 3 will also be showing highlights in the evening of each day.